“Our family of four traveled to Belize in May knowing there’s always something unexpected waiting there. We took some computer equipment to the small village of Bomba, far back in the jungle, hoping to give the people there, and specifically the school kids, access to information. Here in the US, we take for granted the amount of information we have access to on a constant basis. The kids in this village go home at night to a village with no internet, no computers, no extra books to help with their homework. They’ve only had power in their village for about a year and they are beyond excited about it. That gave us the opportunity to set up this mini-computer lab for them to use. We spent some time teaching the teenagers how to use everything, how to fix basic problems that may come up, and asked for feedback on the types of information they want next time a team comes. They now have 5 laptops and a media server full of educational materials, music, pictures, and videos. A generous anonymous donor gave to help us purchase every bit of the equipment and we are extremely grateful. A highlight of our time in Bomba was seeing one of the girls, who is now 11, looking at some of the pictures of herself and her family from several years ago. She giggled to see herself and her brothers as little kids. We’re always excited to see our friends in Bomba and strengthen those relationships. Out of all the people we’ve met there, it’s hardest to stay in contact with them because they are so remote. Jon and Clayton were also able to spend some time working on a computer lab we’d set up years ago, making sure everything was running well and fixing some minor problems. The hot, humid environment and no windows on buildings can be brutal on computer equipment. We’re grateful that the lab equipment is still running and could be fixed. 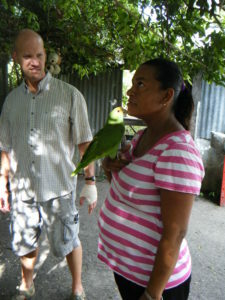 While he did that, Matthew and I got to be a part of village life in Bomba. Our friend Shelmadine is a wealth of knowledge – she always teaches us so much about the land, the people, the history of Belize. She also feeds us really well and helps us avoid the worst of the bugs! Next we moved to the capital city of Belmopan to reconnect with our friend Adrian. He surprised us with a two-night stay at a cabana where he works. He’s a manager at a lodge on a nature reserve in a rain forest. 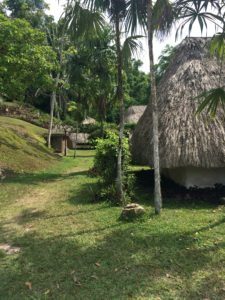 It was a stunning place with lots of wildlife and Mayan ruins. He set up a three-hour cave tour for us, which was one of the highlights of the trip for all of us. We swam through an underground river, climbed up steep rocks and a ladder, squeezed through very tight spaces, and saw endless beauty in the cave formations. It struck me how God creates such beauty in every single part of this earth. So many places exist that human eyes will never see. All for His glory. All because He is Creator. I wish we had pictures to show, but no cameras are allowed there in order to protect the cave and the Mayan artifacts that are throughout it. It was one of the best adventures I’ve personally ever had and I’m grateful we got to do it. The week before we left, Jon was talking with a guy he sometimes works with and mentioned we were going to Belize. The guy said, “I have some good friends there, I’ll call them right now and tell them you’re coming. You should meet them.” So he got us connected with Gary and Jerri, who are from Clanton, AL. 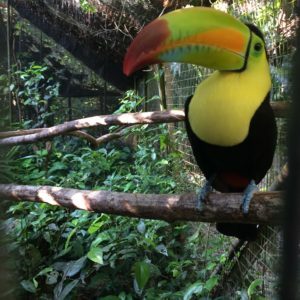 While in Belize, we went to visit “Toucan Farm,” the little homestead they’ve set up on Barton Creek. They are doing a wonderful job of being self-sufficient so that they can be a part of the community there and build meaningful relationships. It was a joy to spend time getting to know them and we look forward to going back next time we are there. Our last stop was another lodge where we’d reserved a spot months ago. It’s a place I happened across on the internet that sounded interesting. Our first impression was that this was just a place to lay our heads and then move on to the airport the next day. 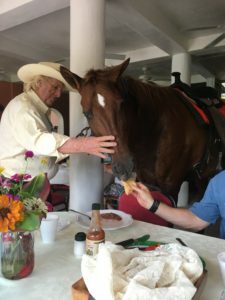 Then we met the owner, a real-deal cowboy from Montana who has lived in Belize for 40 years. He runs a horse and cattle ranch, farms various crops, and has a boys’ home on his land, in addition to running the lodge. The property has a miniature zoo with a spider monkey who likes to sit in your lap and a rescued jaguar that our boys spent hours watching. And a pool. Luxurious, clean water after a week of being hot and dirty. We got to spend a good bit of time talking with the owner, seeing his impressive art and artifacts gallery and hearing about all the ways he’s helped impact Belize for the Kingdom. He became a believer before he came to Belize and uses his properties to provide opportunities and to host mission teams. On the last night, we had our new friends Gary and Jerri join us for dinner at the lodge along with their pastor and his wife, David and Dupe, who are from Nigeria. They have been in Belize for 9 years and lead a small church. It turns out, the owner of the lodge knew them because they used to work and teach at the boys’ home on his land. David and Dupe are in the process of starting a high school for some of the poorer villages in their area. It’s a huge need because most kids only have the opportunity to go to primary school because there is no high school nearby. Even if they wanted to make the effort to travel to a high school, most can’t afford it. Dupe has always been a teacher and dreams of providing more opportunities for kids that currently don’t have many. We talked a lot about how we can help support their mission through IT and are excited to see how God uses them and their church.